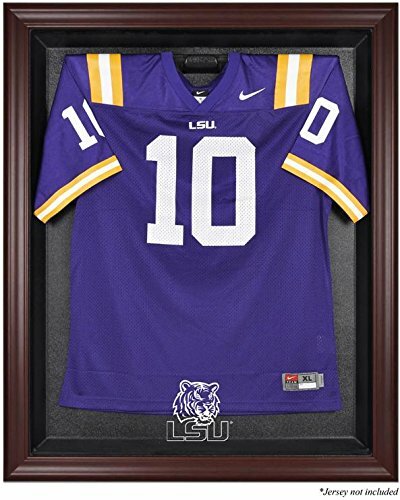 The LSU Tigers mahogany framed logo jersey display case is made from a durable, high strength injection mold backing, and then encased by a beautiful mahogany finish wood frame. The inner dimensions are 38" x 29 1/2"x 3" with the outer measurements of 42" x 34 1/2"x3 1/2". The case comes with a 24" clear acrylic rod that will display a collectible jersey. The display opens from right to left and is easily mounted on the wall with five screws (not included). This is for the display case only. Memorabilia not included. View More In Memorabilia Display & Storage. If you have any questions about this product by Sports Memorabilia, contact us by completing and submitting the form below. If you are looking for a specif part number, please include it with your message.